11:30am – 2:30pm: Erik Augis Trio at Third & Hollywood (Grandview). The area’s only weekly jazz brunch (that we know of) provides a great way to start your celebrations early! Often joined by bassist Andy Woodson and drummer Louis Tsamous, veteran pianist Augis will share festive standards and more for your enjoyment alongside a great menu. Visit the restaurant’s website for more info and to make reservations. 5pm – 10pm: NYE Jazz & Dinner Experience at Copious (above Notes). Copious-Notes will take a break from their weekly Bobby Floyd Showcase to move the music into the Copious restaurant space upstairs to pair a 3 course pre fix menu with lively jazz entertainment from the Bobby Floyd Trio from 5 to 7pm and the Omni Tet Trio from 7:30 to 10pm. Call (614) 947-1520 to make your phone reservation (required), and click here for more info. 6pm – 12:30am: Clave Sonic at Barcelona. This evergreen Latin jazz fusion outfit makes its annual NYE appearance at one of Columbus’ finest restaurants. The band will be playing sets throughout the night for your listening enjoyment while you dine. Click here for reservation info. 7pm – 9pm: In Full Swing at Franklin Park Conservatory. The local all-star big band returns to the lush environs of the conservatory for a swing dance party. For this performance, the band will feature vocalist Kelly McLennan. The event is free with admission to the conservatory. 8pm – 12am: Rachel Sepulveda Quartet at Hyde Park Arlington. A top Columbus destination for straight ahead jazz and fine food and drink for over 25 years, Hyde Park again offers NYE jazz performed by some of the area’s best. Vocalist Sepulveda will be joined by her quartet for classic jazz and swing tunes with a festive twist. Call (614) 442-3310 for reservations. 8pm – 12am: Dan Rowan Trio at Black Point. Part of the Hyde Park family of restaurants, this modern steakhouse and seafood restaurant in the Short North Cap is a central destination for lively trio jazz. Vocalist and pianist Rowan will lead a trio for some warm seasonal favorites. Call (614) 221-5294 for reservations. 8pm – 1am: Colin Lazarski at Jeff Ruby’s Steakhouse (Downtown). This newly opened addition to the growing Jeff Ruby’s Steakhouse chain is a fresh local option for combining classic jazz with world-class steaks, seafood and sushi. Guitarist and vocalist Lazarski will entertain with his New Orleans flair – Click here for more info or call (614) 686-7800 for more info. 9pm – 1am: Brian Michael Smith with the John Vermeulen Octet at La Scala (Dublin). Smith, one of the area’s finest Sinatra-style crooners, will be backed by Vermeulen’s swinging ensemble for a night of classic Italian cuisine, great music, and dancing. Call (614) 889-9431 for reservations (required). 9pm – 1am: Rick Brunetto Big Band New Year’s Eve Celebration at 94th Aero Squadron. Brunetto and his high-powered 17-piece orchestra present another great NYE party in the home of their weekly Thursday night dance parties that have been going strong for over 27 years. The band will feature all three of their regular vocalists – Tia Harris, Michael Phillips, and Jeremy Lahman – for your dancing and listening enjoyment all night long. The evening starts with dinner at 7pm. Click here for more info and call (614) 237-8887 for reservations. 9pm – 2am: NYE at Brothers Drake. The meadery’s popular New Year’s celebrations are always fun events, and this year’s iteration presents three bands for a variety of jazz and funk sounds with great jazz musicians in all of the bands. Jamming funk band Osage kicks off the show at 9pm, modern jazz fusion powerhouse Safety Squad follows at 10:30pm, and young funk fusion collective Funk Worthy wraps up the evening starting around 12:30am. Tickets are limited, so click here to buy them and learn more, or stop by the meadery soon! NEW: 9pm – 12:30am: Lisa Bella Donna Trio at Asterisk Supper Club (Westerville). A likely fusion-leaning trio featuring Stan Smith on guitar, Jim Tussing on bass, and Bella Donna on drums, will be playing at this intimate spot in Uptown Westerville. More details here – it’s a free show, but call (614) 776-4633 for reservations. 9:30pm – 1:30am: Urban Jazz Coalition at the Backstage Bistro at Shadowbox Live (Brewery District). 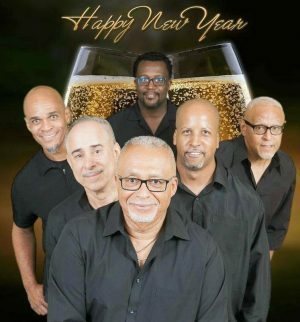 Columbus’ internationally-renowned smooth jazz titans, who celebrated their 22nd year as a band in 2017 with the new album XXII, make their yearly appearance at this intimate bistro. The event includes a dinner banquet and over 3 hours of great contemporary jazz. Click here for more info and to buy tickets. 10pm – 1am: Dave Powers Trio at Lindey’s (German Village). Pianist/vocalist Powers and his trio will bring holiday cheer to this late night gathering at one of Columbus’ best-regarded restaurants. Call (614) 228-4343 for reservations. 10pm – 1am: New Years Eve at The Light of Seven Matchsticks (under Natalie’s). Natalie’s recently opened a speakeasy space in the restaurant’s basement that has been garnering rave reviews. For their first New Year’s party, members of the band Whirlybirds will be playing a mix of the band’s material and Dixieland tunes while wandering the intimate space “minstrel style.” Tickets are going fast – so click here to grab a spot! 10pm – 2am: Hoo Doo Soul Band at Rumba Cafe. With a talented lineup that includes many great jazz musicians, the Hoo Doo Soul Band continues to provide top-notch soul and funk on Sunday nights as it has for over 20 years. This is a band made to soundtrack your good times on NYE. Tickets are $20 at the door, but buying in advance here is only $18 per ticket and highly recommended. Here’s hoping you plan to have a jazzy, safe, and happy New Year!